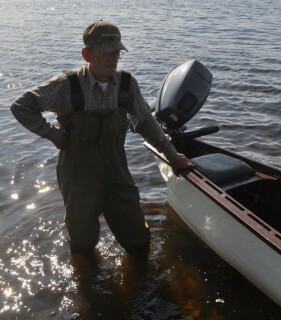 Basil is one of few builders in the area that can still be found building wooden Gander Bay boats. While others have switched from fir (known locally as var) to spruce for planking, Basil continues to build with fir. For planks and gunnels, timber needs to be twenty-five feet long but with local fir trees suffering damage from invasive insects such as the sprucebug, good quality fir is increasingly difficult to find. At one time, a boat could last for twenty years if it would properly maintained, but builders in the area find that wood rots much quicker than it used to. Basil expects his most recently constructed boat to last only three or four years before needing repairs.